It all started in the Pontypridd educational settlement on the 29th November 1949, when a small gathering of 19 men met with a view of forming a choir. The decision was taken and the choir formed with the title of “The Pontypridd Educational Settlement Male Choir”. Mr. Gwilym T Jones was appointed conductor and miss Agnes Wilson accompanist. Their first concert was given in June 1950, it is of great interest to note the name of the young guest pianoforte soloist that evening,one Dorothy Davies watch for it in the future. The first thought of entering the field of competition came the following year and at the first time at the Llanharan “Semi National” Eisteddfod the choir were awarded first prize and two weeks later at Glynneath were again placed first. The choir was much involved in centenary celebrations surrounding the composing of Hen Wlad Fy Nhadau and the bicentenary of the building of the famous Pontypridd “Old Bridge”. The choir were much involved in centenary celebrations surrounding the composing of Hen Wlad Fy Nhadau and the bicentenary of the building of the famous Pontypridd “Old Bridge”. Amongst many concerts in 1959, two were certainly memorable; Stuart Burrows was the guest artiste in the first one and in the annual concert Sir Harry Seacombe and Geraint Evans appeared together for the first time in their careers and with W.J. Evans (Geraint’s father) conducting the choir,there was quite a family feeling about a successful evening. Joyce Durston was appointed musical director in 1964 and Dorothy Ingram (nee Davies) was appointed accompanist, thus bringing together two musicians who started their connection with the choir to many successes both on the concert and competitive platforms. At this time arrangements were well advanced for a nine day visit to Germany as guests of the Liederkranz Oberensingen and this visit turned out to be the start of an on-going friendship In fact the building blocks of the association were firmly put together the following year when the Liederkranz came to Pontypridd for a very successful stay. 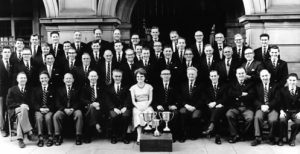 1970 Was the 21st birthday of the choir and a celebration dinner was arranged with patrons Sir Geraint Evans and Stuart Burrows, together with president P. Raymond Jones and many vice presidents and civic dignatories attending. 1973 Saw the choir take part in the H.T.V. Male Choral Competition. Twelve choirs were in the opening knock-out round and the finalists were Cwmbach and Pontypridd. The final of this competition was held in the H.T.V. Studios and after a tense wait for the adjudicators to deliberate Pontypridd emerged as clear winners and it was a win that reflected very well indeed of the high standard expected from the choir by both their conductor and accompanist. 1974 Was a high point in the history of the choir, when we won the National Eisteddfod of Wales, our Silver Jubilee year. The musical teams Durston and Ingram were carried shoulder high by enthusiastic and excited choristers. This was the first time for the trophy to come to Pontypridd at its second attempt(the previous attempt was at Newtown in 1966 when the choir came second). 1975 A polish choir “Zzk Henjau” visited Pontypridd and were given a warm welcome and started on a busy week of visits and concerts. Pontypridd choir visited Poland in 1976 as guests of “Zzk Henjau”, which was a memorable 10 days full of action and friendship. 1977 Brought another change to the musical team when Dorothy Davies Ingram became musical director and Jonathan Gulliford joined as accompanist it was with great delight that the choir brought home the knight of St. David memorial bowl from the Rhymney Valley Eisteddfod. In actual fact this notable success was repeated the following year when the cup again came to Pontypridd. In 1989 Dorothy Davies Ingram became the first woman to conduct the 1,000 voices in the royal Albert hall and after 11 years as conductor to Côr Meibion Pontypridd,changed her role to become deputy conductor and accompanist,with Jonathan Gulliford taking up the position of director of music. A very interesting initiative has been the launch and success of the john tree award scheme which has been made possible by the generosity of R.T.J. Tree Esq., choir president at the time of the launch in 1991. The objective of the scheme is to forge links with the schools and the choir and to award annually a sum of money to the musician / singer of the most outstanding ability and promise in each of the four comprehensive schools in the Pontypridd area. The pupil nominated to receive the award will be encouraged to take part in public at the choirs annual celebrity concert.